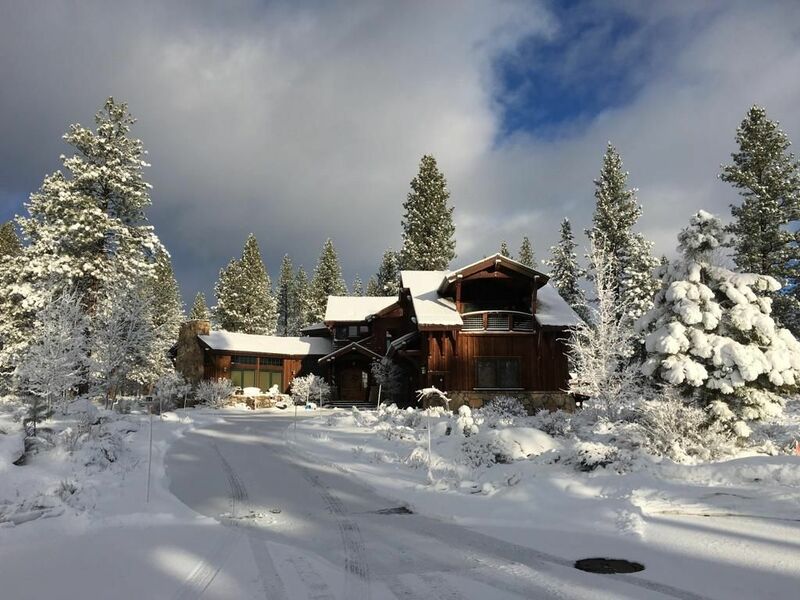 This masterfully crafted Executive Lodge is located in Old Greenwood outside of Truckee, North Lake Tahoe’s Premier Four-Season Resort Community and framed by eighteen holes of perfection, courtesy of Jack Nicklaus Signature Golf. 600 acres of towering Pines and meadows. The home sits on over ¾ acre at the end of a private cul-de-sac on the 14 Fairway and features 4 suites, full guest quarters w/complete kitchen, 100 year old reclaimed Timbers, spacious great room, professional kitchen, 2 large stone fireplaces + 5 spacious exterior patios and decks which maximize privacy and unobstructed views of Northstar Mountain and ski resort. Take advantage of a free shuttle to Northstar Village right from your door. Leave your car behind and enjoy the great shopping, restaurants, and skiing Northstar has to offer. There is an option of accessing the Private state of the art Club House facility on site which includes a restaurant, heated pool, hot tub, spa services, kids playroom, steam room, and exercise gym. This is a great place to start your day with breakfast or unwind at the end of the day. This is a separate fee. Optional access to the private Club (Swim & Fitness)-(separate fee). Access to the Pavilion which includes 2 pools, spa, restaurant, store, and tennis courts. First class in every way! Fabulous! Perfect! The home is even better than the pictures. It is high end in every detail and impeccably clean and maintained. The setting is magnificent. There is only one thing wrong....you will never want to leave! We had a church retreat with 10 ladies and the kitchen is large and functional enough where we gathered and all worked together with pure joy. Each bedroom has it's own beautiful bathroom. As big as it is and with all the huge gorgeous windows to take in the views, it is incredibly warm. We stayed during the severe storm watch with 6 ft of snow, yet we never felt chilly. I am an interior designer in the bay area, and have very high expectations. This fabulous home met them in every way. Thank you Steve for sharing this jewel with us! Beautiful home with incredible views, cozy, family friendly home. Owner was very responsive as well. Loved our stay! We were initially skeptical based on pictures if the home is large enough for 6 adults and 6 kids. But our skepticism turned into wonderful surprise when we reached property and entered the home. Steve, the property owner is best host. Due to weather forecast he proactively allowed us for early Check in and accommodated late check out. He in fact responded to text messages within minutes. The game room was hit with the kids. The large dining table was large enough to accommodate a 6+6 thanksgiving dinner. Gas cooking range made cooking delightful and quicker. At least two rooms had large king size bedrooms, one room with 2 bunk beds that could sleep 4. All furniture very clean and comfortable. Deck is awesome looking into a large open continuous space that makes you feel that you are at vacation. We relaxed taking sips of tea with a nice snowy view. It snowed on both days and property just looked like it looks in picture. Boreal and Soda springs were just 20 minutes of car ride given the weather condition. We would stay again at this location, if we go there. Property is very nice, high praise to the owners for offering such a beautiful large home. The location is so very relaxing and home made for a group. We had a wonderful ski vacation at Lookout Lodge! The home accommodated our group quite well. The layout is superb for families that want both connecting time and space. The kitchen is a lovely gathering space; the rooms are comfortable; and the game room was a fun relaxing getaway for the kids. All enjoyed the hot tub! We rent higher-end cabins throughout the ski season and this was by far one of our favorites. We will be returning for summer and ski season! Steve was also very easy to work with to answer questions, etc. Also, the overall home was clean, comfortable, inviting, and the the fireplaces provided great warmth to make a long day after skiing relaxing! LOVED. We rented Steve’s home this February and couldn’t love it more. Upon arrival we marveled at the spacious layout and attention to detail with designs. We immediately felt at home. With 6 adults and 4 children we had plenty of space to all hang out together but also have some time as adults, families etc. Everything was in perfect working order and the house was stocked with all the necessities... and then some. We loved our time there and hope to make it back in the years to come. Thanks Steve! Rates are subject to change until the final agreement has been signed processed. In addition, if Private Club access is requested. A separate fee applies depending on number of days and guests.